I made a quick visit to Mumbles Pier a couple of weeks ago to check on the breeding Kittiwake colony and was very pleased to see that their numbers have swelled to at least 275 individuals, many of which are now paired up and in the last throws of nest building. As far as I could see there are as yet no eggs, but several birds were busy mating so it can only be a matter of time. While watching the Kittiwakes I remembered the comments I had made in my last post from the colony regarding the piers planned regeneration and how this could be the last opportunity that we have to see these birds at their current home. At the time I had very little information to hand regarding what the future held for them and so embarked on a mini fact finding mission. I have been in contact with the developers and also had a good read through all of the various planning applications and environmental studies that have been submitted to Swansea council and which have recently received planning approval. The picture is now a lot clearer so I thought I would provide an overview for those, like myself, who are interested in the future of the colony. First a little history. 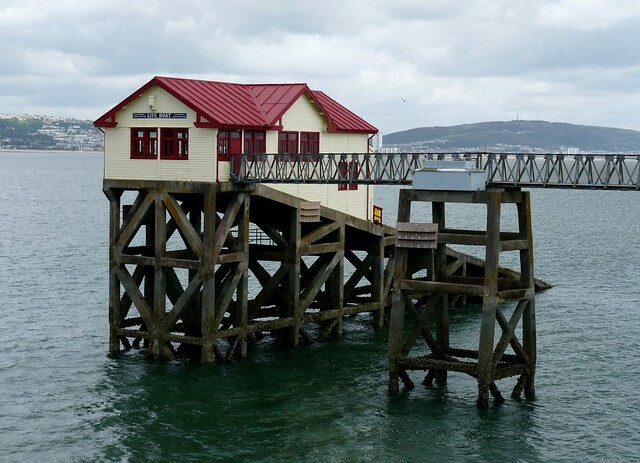 Mumbles Pier was originally constructed in 1892 and has been a grade 2 listed building since 1992. It underwent extensive restoration after the second world war but since then has been steadily falling into disrepair. 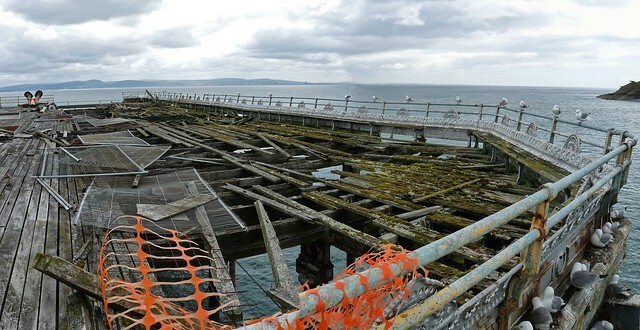 The result of decades of exposure to sea air and recent fire damage has left the deck and underlying structure of the pier in an extremely poor state, large sections of which have been fenced off for public safety. As the popularity of the pier faded and visitor numbers fell the Kittiwakes started to move in. Originally there were at least three separate Kittiwake colonies around the Gower peninsular, but in recent years these have all virtually ceased to exist with birds that previously nested in them presumably moving onto the pier. As a result its importance locally is extremely high. When taking into account the species long term decline in the UK and the presence of only two other colonies along the South Wales coast its importance on a national level can also not be underestimated. So what effect will the redevelopment have? The proposal is for a wholesale replacement of the upper deck of the pier including much of the underlying structure. This will almost completely remove the existing ledges that the Kittiwakes build their nests upon. I have received contradicting reports that the replacement steel will be specially widened to accommodate new nests, and also that it will be designed with sloping edges to prevent nesting in the future. I am tempted to believe that the latter option is the chosen approach as the various planning documents are very focused on a colony migration scheme rather than encouraging the Kittiwakes to return to the refurbished pier. The migration scheme involves the erection of purpose built ledges on the existing lifeboat station that adjoins the pier and on the supporting legs that hold up the walkway between the two structures. Three sections of these ledges are currently in place as a trial but on my visit they were being completely ignored. In my opinion this is most likely as a result of an abundant supply of adequate nesting sites on the pier itself, rendering the new ledges surplus to requirements. If the trial is successful (though it's hard to see how this will be judged when the birds currently have no incentive to use them), the pier will be completely netted off at the completion of this years breeding activities to prevent the birds from nesting there again next season. Given that Kittiwakes are known to be very adaptive birds it is expected that on their return they will use the new artificial ledges or start to use the two islands located just off Mumbles Head instead. This approach is backed by the Countryside Council for Wales and its success is a key condition to the planning application receiving approval. Now for my thoughts on the scheme. Firstly I am fully in agreement that the redevelopment of the pier is necessary and should go ahead. The current structure is at risk of being lost altogether which will provide no benefit to Kittiwakes or to the local tourist industry. Therefore action needs to be taken but it needs to be done in harmony between the needs of locals and the wildlife. On this basis the provision of artificial ledges does seem to be the best option available to the pier owners in terms of providing adequate nesting sites for those lost during the redevelopment. However I have concerns with the limited time frame in which trials of the ledges are to be carried out. As I have mentioned above the trial currently taking place has little chance of meaningful success as the Kittiwakes have no incentive to use the new ledges with the full extent of their usual nest sites still available. A better approach may have been to net off half of the pier for a season and then to see if any of the new ledges are used. I also have reservations about the new ledges themselves. As you can see from the photos above they are very basic in construction. Has any consideration been given to ledge width, the materials used or if different designs should be trialled at the same time to judge which the birds prefer? Also I would hope that there is a commitment on the pier owners to ensure that these ledges are maintained and are not left to deteriorate into nothingness as the years progress. In summing up I hope that the Kittiwakes are as adaptive as it is hoped and that the planning conditions attached to the work are adhered to closely and not brushed under the carpet once work starts in earnest. It is inevitable that there will be quite major disruption to the colony over the next couple of years but hopefully the Kittiwakes will continue to return to the bay and embrace their new conditions. I'll be following the development closely and will report back any significant milestones on here. Although the plans for the pier have been approved they are conditional on the owners also receiving permission for a hotel on the land at the pier head. Without this no work will start, but assuming that it is forthcoming preparatory work will begin in September. As a result if you want to see these birds at close quarters in their current location then I'd pay a visit over the next couple of months. Even if the colony remains at its present size it is unlikely that we will ever experience such fantastic views of these Kittiwakes again. Such a beautiful bird!! I really hope the pier and the birds will a big success! An excellent and informative post Adam. It would be a great shame to lose these birds because of building development. Let's hope a happy medium can be found; one that suits man and birds. Thanks for the update Adam. I also read through the background info following your initial post and share your concerns. Kittiwakes are a very adaptable species so whatever the 'ledge' outcome I'm sure the colony will relocate but it will be a pity to loose that special close encounter. Interesting post on the Kittiwakes. I hope they will adapt to their new habitat. Fabulous photos, the Kittiwake is one of my favourites. A great post from Mumbles pier. A beautiful set of images. The first one is perfect. Well done. Awesome photos! The first on is a stunner. 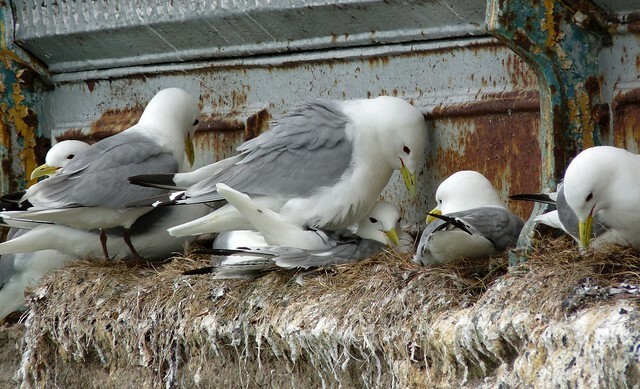 It's wonderful that the Kittiwake has alternative nesting sites. Great post and photos! Great essay summing up the problem of development and wildlife!! Boom & Gary of the Vermilon River, Canada. 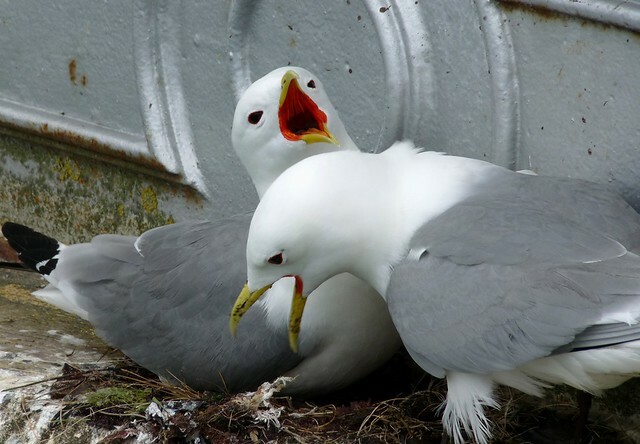 Great photos of the Kittiwakes. I hope the new development and the proposed moving of the bird colony both work. A nice post Adam such a beautiful bird to have locally. 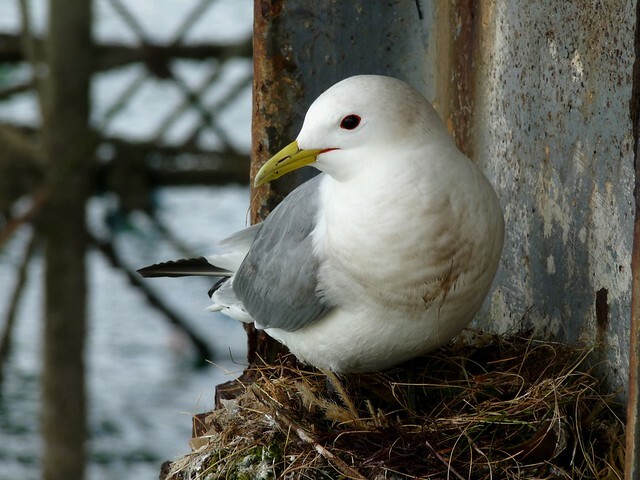 It gives me hope that such issues as Kittiwake nesting oppotunities are being considered with this rebuild. It is a credit to you Adam for keeping this aspect of a worthy project in the forefront. Man is mostly winning over the nature. It hurts. Your shots are great! 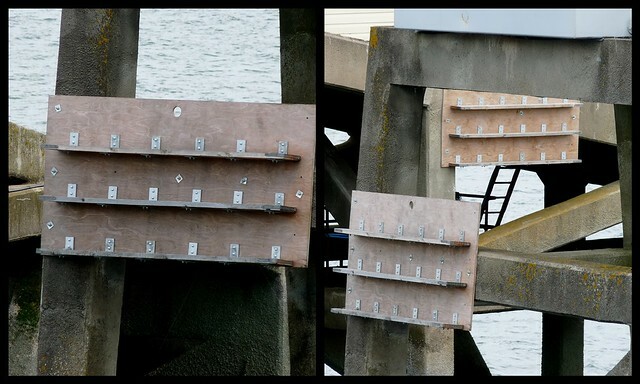 Great post..hoping the Kittiwakes take well to their new ledge. Very informative post, Adam. Let's hope the Kittiwakes can adapt to whatever development takes place. I'll be going round to check on their development soon. Very informative post with your photos illustrating the activity of the KIttiwake colony and the problems associated with renovation of the pier. Wow thanks everyone for your kind comments. It seems that the Kittiwakes are always a hit whenever I talk about them on here. I too hope that they adapt and will be reporting back on their progress to you all. A great informative post, and nice shots of the Kittiwakes and their pier.